I hope that everyone has been enjoying our summer peach series. It’s been fun talking about my favorite fruit and come up with new recipes to enjoy it. This is the 2nd to last post in the series or the penultimate. If you are ever in the Fort Valley, Georgia area you can stop in at Pearson Farm. You can see how they pack their peaches, enjoy their retail stores, eat some homemade ice cream (peach and butter pecan! ), and more. I have heard some serious good things about the peach ice cream. The season runs from May until mid August and they are open Monday – Saturday from 9am to 5:30pm. These peaches are Early August Prince peaches. I enjoy the pretty yellow color on the skin. 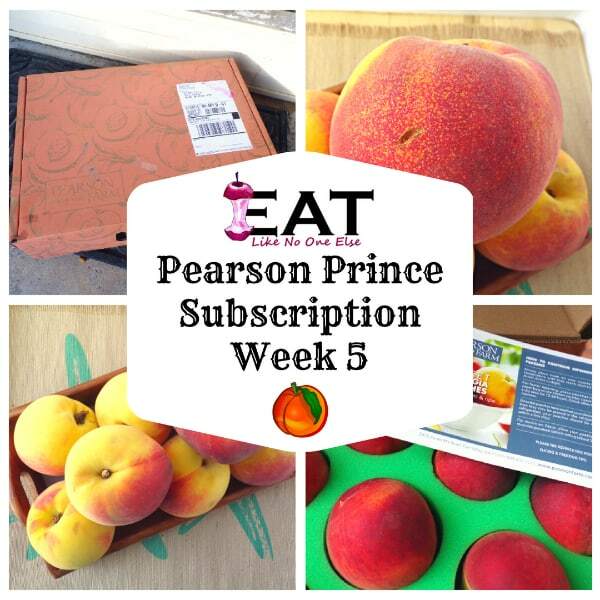 The peach in this week’s box is the Early August Prince Peach – yes I am aware it’s not August yet. It is a new variety created with the hope of extending the peach season. It’s a pretty good peach, the sweetest one I have received (more on why that is in a moment). These peaches are big in size. And this is not a case where jumbo fruit means bland fruit. Early August Prince holds it own when it comes to flavor. 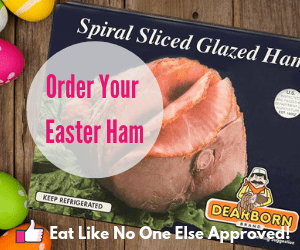 They are a freestone peach, so the pit is easy to remove with no trouble at all – a great feature when you have to pit a lot of peaches for something like a pie or jam. The downside of this peach variety is that the trees don’t produce well every year. 2018 was a good year for them at Pearson Farm, so I am fortunate to be able to enjoy them, and enjoy them I certainly did! As I said Early August Prince peaches run on the big side. Maybe record breaking big. One of the peaches from this year’s harvest weighed in as a whopping 1.8 pounds!!!! Pearson Farm actually contacted Guiness because the record they listed was 1.12 pounds. It’s not official yet, but hopefully Guiness will bestow the honor upon Pearson Farm. Here is a video from their facebook page showing the unofficial world record peach. Have you ever noticed that on some peaches and nectarines, there are some small spots? Have you ever wondered what those were? They tend to appear on the bottom part of the fruit further away from the stem. Is something wrong with the peaches? On the contrary there is something very right with them. See those small orange-ish spots on the skin? 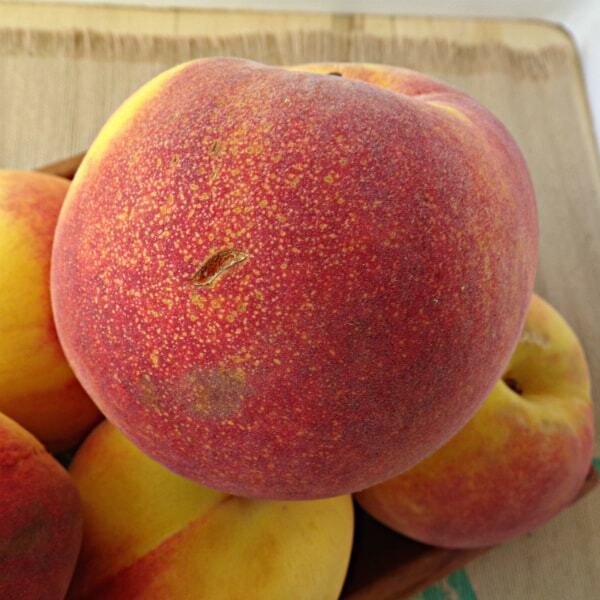 Those are your sugar spots – a telltale sign you are about to eat a super sweet peach. These spots are called sugar spots. The spots are actually sugars crystallizing on the outside of the fruit. When you see this, it indicates you are getting a pretty sweet piece of fruit. The Early August Prince peaches I received in this week’s shipment displayed some sugar spotting. The moment I saw that I knew they were going to be pretty good. 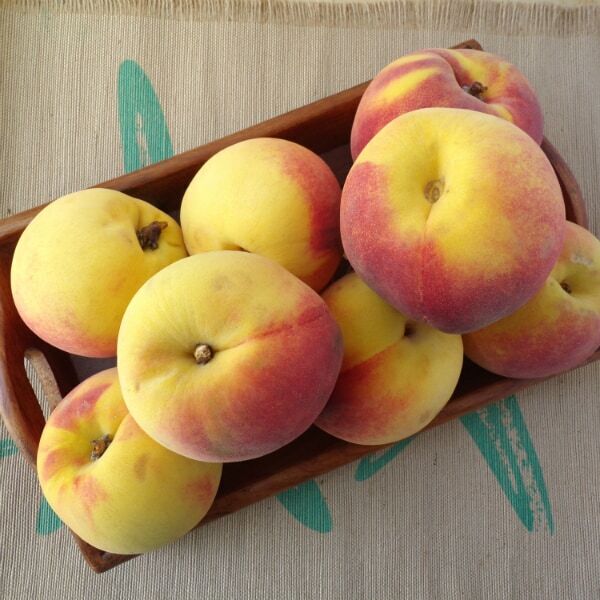 The peaches and nectarines that you find the spots on are the ones you want to buy! 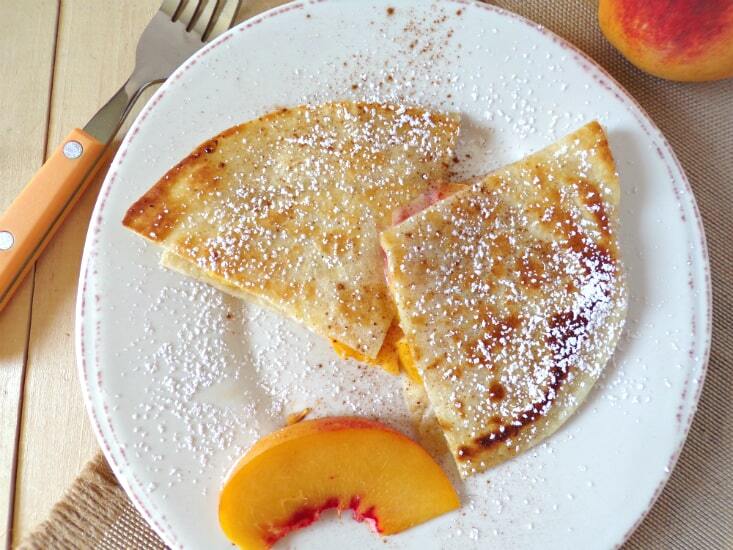 Try this peach dessert quesadilla and you will wonder why you never thought about doing dessert inside a tortilla. The simple quesadilla – what is not to love about a tortilla filled with melted cheese? It is a simple delight. It got me thinking, what if I made a dessert quesadilla with peaches? Woah! Take a moment……I know your mind has been blown now. 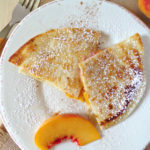 The secret to these peach quesadilla is, first slicing the peaches thin enough so they can cook before the tortilla burns. Second, adding a layer of mascarpone cheese mixed with a little bit of vanilla extract. Cook that bad boy up and sprinkle some powdered sugar and cinnamon on top. It’s a quick, simply easy dessert that will leave everyone wondering why they never tried making a dessert quesadilla before. 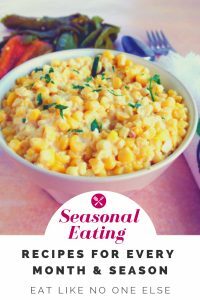 In case you have never mascarpone cheese before you can find at most grocery stores either where the cream cheese would be or the specialty cheese section near the deli, it should be near the brie – which you could use for this recipe if you wanted as well. I love to pull out my electric griddle for cooking quesadillas. I can cook multiple ones at the same time, which you can’t do if you are just using a frying pan. The Presto Electric Griddle has never done me wrong. Combine mascarpone cheese and the powdered sugar in a small bowl. Add a drop or two of vanilla extract. 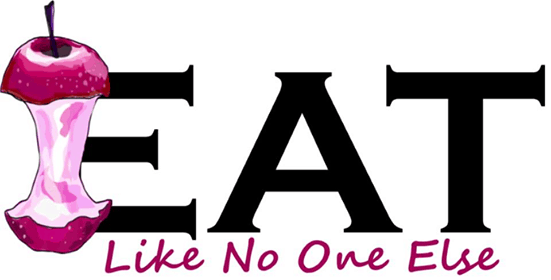 Heat up a frying pan or electric griddle to high heat. Spread a thin layer of mascarpone on 3 tortillas, leaving some room at the edges. Spread a thin layer of mascarpone on 3 more tortillas, and place them on top of the tortillas with the peaches. Butter your cooking surface, and add the tortilla(s). Cook until brown on one side and carefully flip over.